Whether I'm helping you create an intimate patio garden outside your kitchen door or a planting of tens of thousands of trees, shrubs, perennials and bulbs stretching along several city blocks, your project will begin with a site analysis. 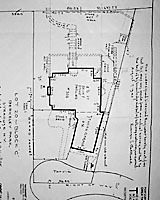 Site, structure and feature dimensions - if available, a survey, at right, showing the location of structures and improvements on your property as well as copies of structural blueprints, septic system and utility locations, etc., are all very helpful in developing a base plan for the project. Site inventory - in addition to collecting information about any structures on the property, I'll also assess and take pictures of other features including the condition and location of existing plant materials, sun/shade patterns, wind exposure, soil conditions, slopes, water flow, traffic patterns on adjacent roadways, views onto and off of the site, etc. Client requirements - I'll want to know what you want your landscape to do for you. Do you want it to offer a quite outdoor sitting area? Do you want a water feature? Do you want bold colors, subdued colors, or only evergreens? Do you want to open up views off of your property, or screen undesirable views? I'll ask all of these questions, and many more, as we walk around your property. I'll also ask to go inside your home or office to get a sense of what you see from inside, above left, looking out into your property. 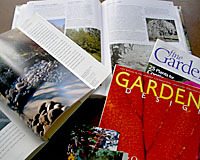 It's also very helpful if you have pictures of plants and/or features (patios, retaining walls, paths, trellises, etc.) you'd like to include in your landscape. Depending upon the size of the property and complexity of the project, our initial meeting might run as long as two hours. In some instances, I'll want to visit the property again to further refine my thoughts before developing a proposal for your consideration. For more information on what to expect in the design proposal, click on the "Design Proposal" link, at right.